Hola!! 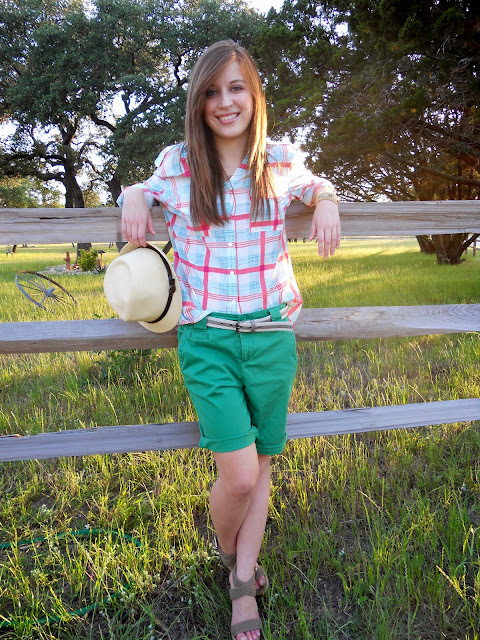 It is heating up here in Texas so shorts are one of my main wardrobe staples right now! I saw these boyfriend shorts and snagged them up in two colors. I love their casual vibe and how they are super comfortable and cute without being really short! I spent all last night talking my little brother through what it's like to start a blog. Mind you, I'm still a novice, but loving every second of it! He has "tons" of ideas! He's too funny! I'll keep you posted on his blog whereabouts! Sponsor Ads are now available on my blog!!! Check out my Sponsor Page to check out the great options!! Such an awesome and affordable way for you to get your blog or stores name out there! This is such a cool and relaxed look, it reminds me of what the beach and surfer girls here wear to the beach. The shorts are a luvly colour and the hat - I want! Those green shorts are so perfect! I love them. Plus, how you styled them is so cute. 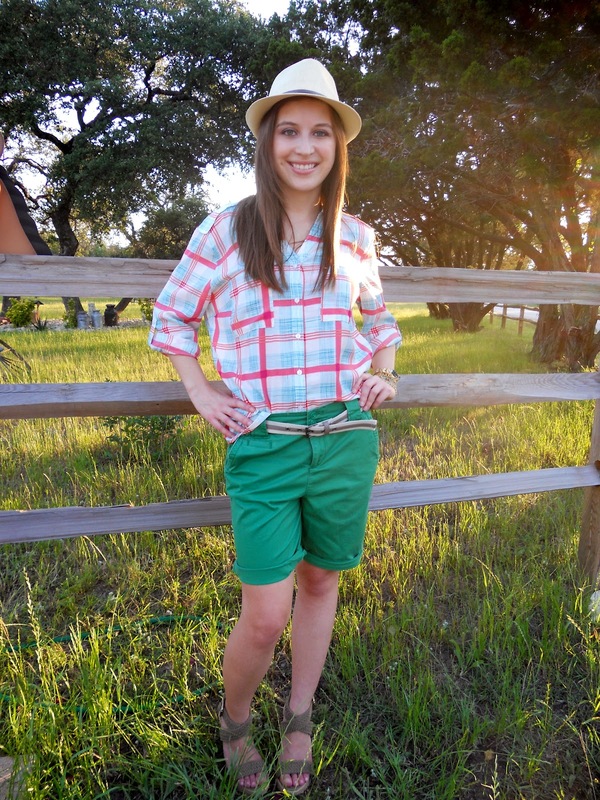 I love the green boyfriend shorts, looks adorable on you! Love the plaid shirt with it, and the hat... all so cute! Love all the colors in your outfit! Cute post. The shorts look really good on you ;) And the hat too!! I am loving the longer shorts that I have been seeing around the blog world. Your green version is great! I love the greeen shortss!!! Love the color of those shorts! I also love that the shorts aren't too short. I can't pull off short shorts so these shorts would be perfect for me. Love your photos! You just look so cool ;) Love the touch of green and hat! I'm loving the green shorts how cute are those. Casual outfits are my favorite type to wear especially when it starts to heat up outside. Cute outfit. Love the shirt & color of the shorts. I'm a sucker for longer shorts too. Looooong gone are my days of wearing short shorts! These shorts are AWESOME! I love the length and color - i want 'em! And, i need it to warm up here! Aww what a cute outfit for summer! Thanks for stopping by and have a lovely week! You have a fantastic blog here, keep it up! You're so cute :) I love your shirt ! Such cute shorts and I really love those shoes! Love this outfit! The colors compliment each other so well! Love the shorts! Love green and it's a great color for you! Cool shoes too! I LOVE this outfit. Those shorts are adorable!! You look great in that hat, it goes perfectly with the plaid! The green shorts are so cute...and I love the extra blouse-y shirt partly tucked in...adorable. Love this outfit! The color of those shorts is great. 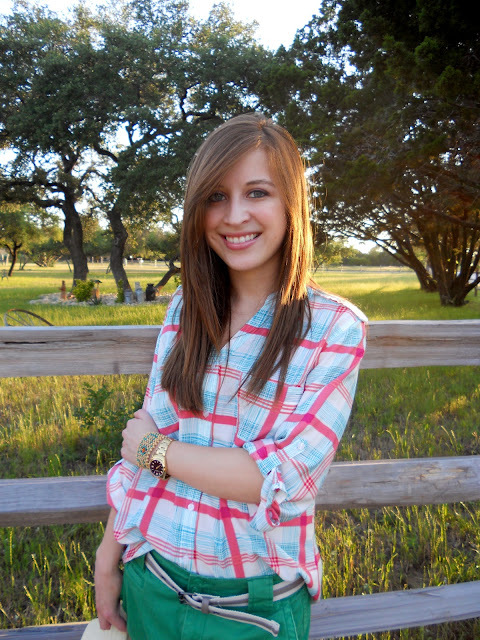 Such an cute outfit and an adorable blog! You have a new Bloglovin follower! Funny casual outfit! Perfect for the spring! Great colour! and Love the photos - it looks like you live in such a beautiful area! such cute shorts and I really like your top, oh and your amazing orange pants in the previous post! lovely look dear!lover your shorts!! so beautiful pics and I really like the shirt!Please check my blog and follow each other! adorable look. It starting to heat up here in Michigan too. okay, seriously, the backdrop to these pictures are absolutely adorable!!! so very jealous! and you are more than perfect! gorgeous outfit! Love your green short and the SM wedges you paired with them. The shorts are wonderful! Very sweet color! and the shoes are lovely too! Cute green shorts! They look cute with that top. I probably would have never thought to pair the two together. Those are so cute with the plaid! I'm all about plaid overshirts right now with jean skirt or shorts...Daisy Duke much? totally diggin' this laid back look! the colors in the plaid top are so pretty..and I love that you half tucked the shirt into the shorts!! I don't think I'd be able to pull this look off half as well as you do! Hey Giovanna! I love your top, it's so vibrant:) Congrats on your new sponsor page! 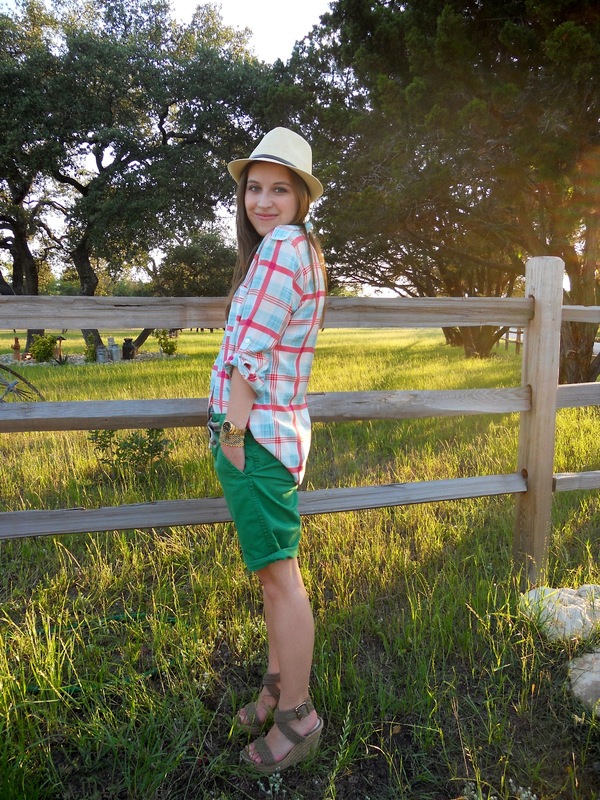 I really love the color of the shorts, and the fedora is a nice touch! Very nice!!!! Kisses from Spain! perfect shade of green. love the background too! Love your shoes! Great photos! I love the green shorts, what a fabulous color. The plaid shirt looks lovely with the shorts. THis is a great summer outfit, so rustic and girlish at the same time. The hat is ultra cute! Those are way cute shorts and I love the bright color! The scenery looks so pretty! I'm having a You Choose dress giveaway on my blog and would love for you to pass by and enter! 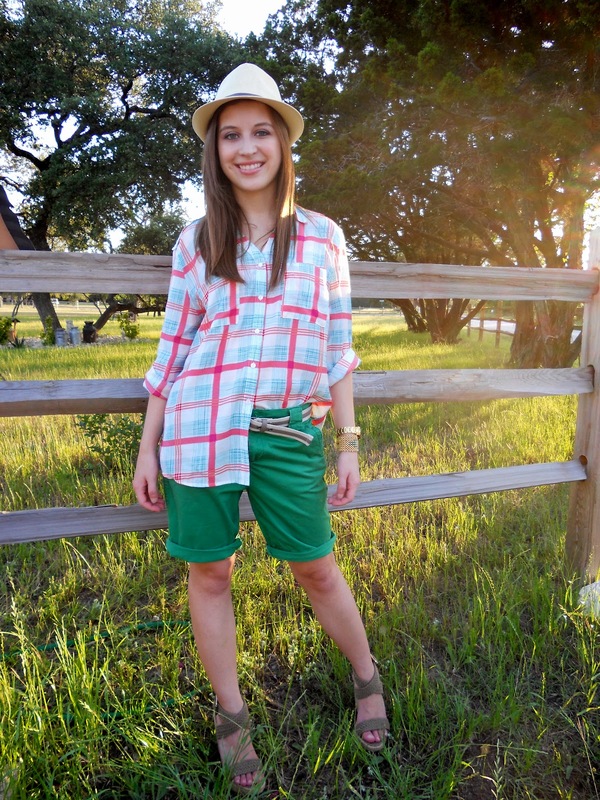 Great casual look- your green shorts look fab! It looks really cool. :) I want your shorts! Wow! Nice dressing and what a combination of colour. I really like it. This photos look like from some movie, they're really good! I love the outfit. I can see myself wearing it. Just found your blog. Now following!